I went swimming yesterday – it was Vobster Quay’s ‘Glow Swim’ – this is what it looked like. A sort of composite image, from memory of course. A deep dark lake with over 100 other people, all wearing little glow sticks, the buoys marking the course all lit eerily from within, and all outshone by the moon when it came out. I was amazed at the colour of the moon for a whole circuit around the lake, until I remembered that I was wearing orange-tinted goggles. Duh! But still, I have put it in as bright orange because that is what I saw. To the left are the branches of the half-fallen-in tree which tries to get me every time I pass it. Who wouldn’t want to be here beneath a Hunter’s moon in October? 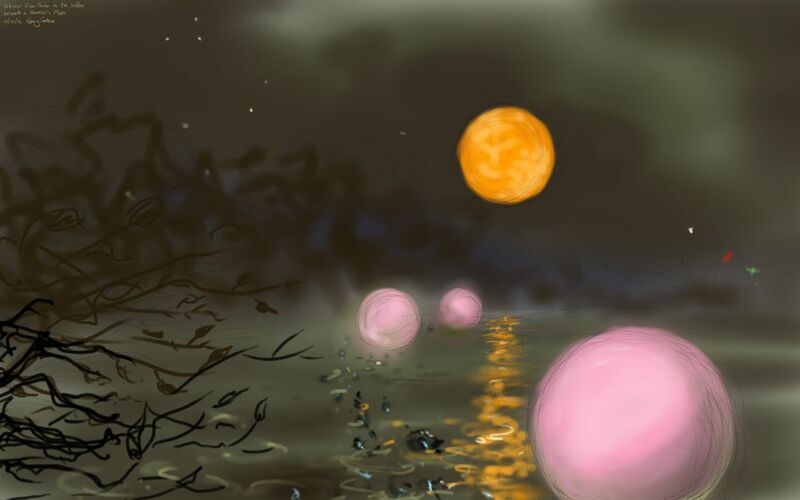 This entry was posted in Events, swimming and tagged art, deep dark lake, digital painting, digital sketch, drawing, Full Moon, Hunter's Moon, Moon, swimming, Vobster Quay on October 10, 2014 by Nancy Farmer. OMG! I hope you wore a wet suit, must have been freezing! yes I did, Wendy, though that was partly because it was dark, so more re-assuring to have a wetsuit to keep me warm, plus wanted to do the full 4 times round course… Went twice round in daylight two days ago without wetsuit and was fine, probably 4 is a little risky, especially driving home afterwards with a cooled-down brain!